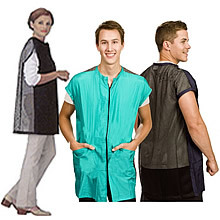 The Stylist Wear #140 Mesh Jacket has a mesh back, protective fabric front with zipper closure, two large pockets, sleeveless. Made of Crinkle Nylon fabric which is soft, lightweight, cool and comfortable. Also is hair and water repellent.